Source: Gifted by the author! While other high school seniors are dreaming about their futures, Sophie and Carter are just trying to make it through each day. Carter is overwhelmed by issues at home as he struggles to support his mother. Meanwhile, next door neighbor Sophie is left to care for her three younger siblings in place of their absent and troubled mother. All that holds these two best friends together is each other, and knowing that each night they'll sit together on Sophie's front porch swing and escape from reality, if just for awhile. But as their relationship reaches a turning point and high school graduation nears, will their friendship become something more? Hello little novella of CUTENESS! GAH. I love Chelsea Fine as it is, so when she gave me this at UtopYA this past summer I wanted to dance around I was so happy. This book has been on my radar for awhile, but just hadn't made time for it. I needed something cute and sweet this past weekend, so I plucked this one off my shelf and devoured it! While this is a cute, sweet novella it does have a more serious undertone. 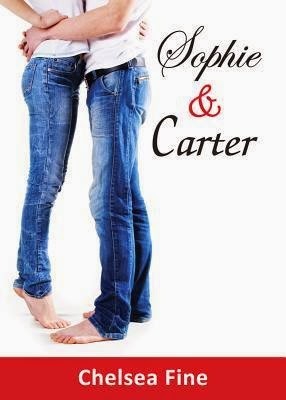 As teens, Sophie and Carter are both dealing with adult problems and it broke my heart for them. Carter, having grown up with an abusive father, is left to deal with taking care of his alcoholic mother and ensure she doesn't harm herself. Sophie is dealing with an absent mom and left to take care of her three younger siblings and try to provide as normal and stable atmosphere as she can for them. Money can be tight and my heart just ached to see Sophie struggle to keep them all fed. Their one escape is each other. After the kids are put to bed and Carter has taken care of his mother for the night, they find themselves seeking solace in one another on the porch swing of Sophie's house. Both of them harbor feelings for another, but have never found the right opportunity to reveal them. At school, the two act like strangers, never owning their friendship in front of their peers. That was something I didn't quite understand, but they felt the need to keep it to themselves and not let outside factors taint what they have. They have one another's backs and have ever since they were young. Theirs is a friendship that will span lifetimes and I loved that it turned to more. Even despite everything, I love the message of hope that Fine relays. Sophie and Carter didn't let their home lives dictate who they were. Yes, they had responsibilities, but they still had hope for a better future for both of them. I think I heard that Chelsea was going to be continuing their story and I really hope she does as I would love to see a full length novel with them. Aww this sounds so sweet but so heartbreaking too. I love novellas that really hit the mark. Great review!